It's a new year, and time for a fresh new approach to film reviews at X&HT. It's important, as we move on for the curation of the Excuses And Half Truths week on Film Riot, to keep the noise levels high and expand the remit. There's only so much I can do on my ownsome. So I'm delighted to announce that my friend and fellow traveller, Leading Man Clive Ashenden, has kindly agreed to post regular film reviews on the site. A van load of college-age friends trespass into the territory of a cannibal family. One by one, they are stalked and killed by a chainsaw-wielding maniac wearing the face of a previous victim as a mask. Yes, here we go again on the remake/reboot/sequel horror franchise treadmill. And this week’s icon of 70s/80s horror to be disinterred for new generation is: Leatherface. Six years after Jonathan Liebesman’s prequel to the 2003 reboot, Lionsgate has picked up the franchise reins from Michael Bay’s Platinum Dunes company and given us: this. So given that I’ve seen all but one of the previous iterations (I’ve yet to experience the delights of Matthew McConaughey and Renée Zellweger in ‘Texas Chainsaw Massacre: The Next Generation’ aka ‘The Return of the Texas Chainsaw Massacre’), and love the original movie; perhaps the first question before we get to whether 2013’s version is any good should be: Why go and see it at all? Why encourage the remake/reboot/sequel merchants by putting money in their pockets? The short answer to that is that I’m a horror fan. I like to think a discerning one, but I realise that choosing to see ‘Texas Chainsaw 3D’ at the cinema doesn’t really help my case there. Plus, I’m curious. Lastly, I find it ironic that a film about a family who recycle parts from dead people into lampshade covers and household ornaments, should find itself treated in the same manner; Apt, even. Plus – it’s in 3D and who doesn’t enjoy being virtually ‘poked in the eye’ with whirring machine tools? Oh… just me then? So this go-around, the filmmakers have gone back to the source – the original movie. This 2013 movie ignores both the three sequels and the 21st century reboot and its prequel. After a ‘greatest hits’ montage of key moments from the 1974 movie (only in 3D), the new movie picks up directly after the end of that movie. So if you’ve never seen the original movie: SPOILER ALERT – this 2013 version will spoil all the best moments from that movie including the ending. An angry mob of locals besiege the ‘Sawyer house’, the site of the massacre and visit vigilante justice on its inhabitants, burning the house to the ground and killing everyone inside. The only survivor is a new born baby, whom a local redneck couple raise as their own. Flash forward to the present day and that baby has grown up to be Heather (Alexandra Daddario), who inherits a house in Texas and takes a roadtrip with her friends to go and collect her inheritance and discover more about her real family. There, a deadly family secret will be unleashed, and the massacre will begin again. 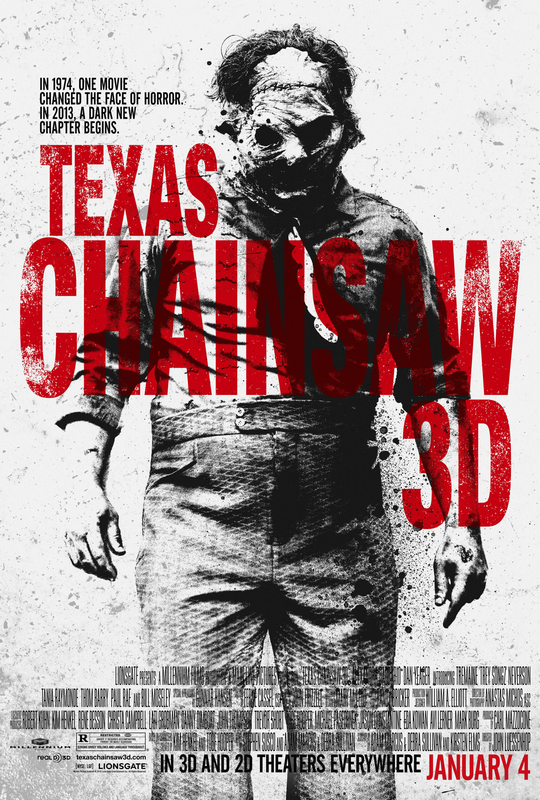 The first thing to note about ‘Texas Chainsaw 3D’ is: what a dull, safe, vanilla exercise in franchise horror. That ‘greatest hits’ montage from the original movie sets the template, and once we get to Texas, the film trudges through a series of tired cover versions of those moments. Also, that having laid out all its backstory on a plate for us in the first ten minutes, we then have to watch our boring Final Girl spend another sixty minutes playing catch up, before she gets to the same place as us, the audience. ‘Texas Chainsaw 3D’ breaks one of the key rules of successful horror cinema: isolate your victims from outside help. Unlike the original, whose house was the only thing for miles around, the new Sawyer house is a Southern mansion, just a few minutes away from a thriving local town of over two thousand inhabitants. The film tries to get around this by having the local law enforcement be corrupt and part of a conspiracy, but there’s always the sense that escape is just a minute away. A word on continuity: Here’s where things start to get sloppy and where anyone who’s paying attention to the connection between this version and the original will likely lose patience. In the section where the Sawyer house gets burnt, suddenly there are a whole bunch of other family members not present in the original film. Original Leatherface Gunnar Hansen plays a new character called Boss Sawyer… and there are now women in the family! Also, somewhat confusingly, Bill Moseley who famously played Choptop in ‘Texas Chainsaw Massacre 2’, is now playing Drayton Sawyer aka Chef. But even putting such quibbles aside, Texas Chainsaw 3D has a very poor understanding of what makes the original work. Like the tagline for one of sequels said: ‘The Saw Is Family,’ and the original is contains a very twisted (and at times very funny) parody of the nuclear family. It also has THAT HOUSE, a masterpiece of production design filled with grotesque sights. The new version kills off Leatherface’s family in the first few minutes, and burns the original house to the ground, replacing it with a bland mansion that has one odd room in the basement. One of the scary things about the original was that Leatherface’s crimes were motiveless. This obviously doesn’t meld well with the horror modern franchise, so in this film Leatherface, like Jason and Freddy, gets a revenge motive. This makes him both more generic and less scary in one fell swoop. Another element that added to the scariness of the original was its grimy, gritty look. Also, it was clearly directed by someone with a unique vision. Director John Luessenhop, previously responsible for the slick, anonymous heist movie ‘Takers’, takes a journeyman approach to this movie too. And it just looks… bland (in 3D). I wasn’t a fan, but it has left me with a new respect for the work of Marcus Nispel on the 2003 reboot, who did at least embrace the grit and grime of the original (albeit in a music video way). Scratching around for positives, there is one decent 3D jump scare and a couple of nice bits of 3D gore. Also, the film does have a couple of interesting ideas where you can see it is trying to do something different. Unfortunately, they both crop up in the last 20 minutes of by which time it’s difficult to care.